Martianus Capella’s De nuptiis Philologiae et Mercurii (The Marriage of Philology en Mercury) is a curious book. It summarizes the entire ancient scholarly tradition on the Seven Liberal Arts, and shapes it in the mould of a satyric frame story. The book is full of ancient gods, ancient philosophers and scholars, and references to ancient myths. At the same time it presents the learned tradition on the arts of the word (grammar, rhetoric, dialectic) and the number (geometry, arithmetic, astronomy and music) in seven tracts delivered by beautiful virgins, the disciplines embodied. The work had a major influence on the Western intellectual tradition: the canon of the Seven Liberal Arts (Trivium and Quadrivium) was not invented by Martianus, but it was his influence that this canon determined the curriculum during the entire Middle Ages (and beyond). 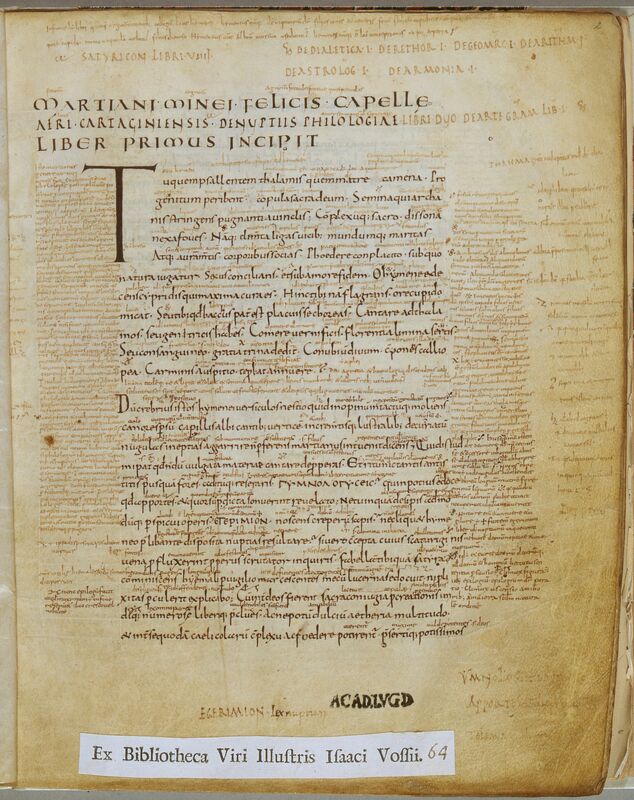 This Leiden manuscript (ms. VLF 48) is a ninth-century copy of Martianus’s text (dated ca. 830). The interest in the text was at a peak in the ninth century. Many copies were made, and the text was enriched with a thick layer of annotations (glosses): notes in tiny letters in the margins and in between the lines. They comment all kinds of aspects of the text: vocabulary, grammar, paraphrase, but also associative connections to other texts from Late Antiquity (e.g. Macrobius, Boethius, Augustine), or the early Middle Ages (e.g. Fulgentius, Isidore of Seville). Their length varies from a single word to long digressions on certain subjects. Sometimes they assume the form of drawings or figures. An attentive observer, furthermore, will see that the book is laid out to contain these annotations: next to the column for the main text, columns are created for glosses, and the main text is written in a relatively small-sized letter, so that annotations can be added between the lines. This makes the manuscript particularly interesting: not only because it is an early witness of the main text, which is known to us in hundreds of copies from the eighth to the sixteenth century, but also because of the presence of the ninth-century annotations enriching the text. They from a unique reflection of ninth-century scholarship. This manuscript was therefore chosen as the focal point of an edition project: researcher M.J. Teeuwen of the Huygens Institute created an online environment in which text and annotations are presented. In relation to this editorial project a complete digital facsimile of the manuscript has recently been published in Leiden's Digital collections.